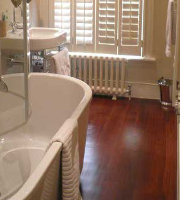 Selecting the right type of varnish for your wood flooring is really important. It gives wood a protective covering that resists dirt and grease as well as water entering it. It will help prolong the life expectancy of the wood surfaces. Interior and exterior use requires different type of varnish. If you are seeking water resistance you will be more limited than if you are just looking to purely protect the wood. You should also consider the stress and traffic your floor is likely to experience. Check first the condition of old varnish if it exists. Old and discolored or damaged varnish needs to be removed using a wood stripper tool. On the other hand, bare wood needs to be smoothed down with a very fine grade of sandpaper. The treated surface needs to be cleaned and dried, and then sealed first using the varnish itself. Thinning it down before using it gives the best performance. The first coat needs to dry overnight before applying the second coat layer. It is necessary to sand each coat lightly before applying the next one and make sure each coat has completely dried. Oil-based varnish takes longer to dry between coats and emits a stronger odor. Varnished floor may be able to withstand light foot traffic eight hours after the final application. To be on the safe side, return furniture and other heavy items after several days. You need also to decide about the final look you’re aiming to achieve. Typically, the choices are between matte, semi, or gloss finish. Some varnishes have a high gloss finish with a tendency to yellow the wood. Wood floor varnishes vary dramatically in price but an important consideration when looking at price is the quality of the product. There are several types of varnish you can get to achieve your final look. For instance, crackle glaze varnish mimics an antique and is meant to look aged. It embraces trendy old and worn look and has become popular with the home owners. Button Polish water base varnish is used to seal your bare wood if you are looking for a natural look. An oil based polyurethane works very well but it also dries slowly. Water-based polyurethane will leave a clear finish whereas an oil-based poly will produce a slightly yellowish floor. Acrylic Varnish is traditional type water based varnish and is very common in household use. You can get it in a gloss or flat finish and you can get it in spray or liquid form. It is not as durable as polyurethane varnish but is still successfully used in a wide variety of projects in and around the home. Tinted Varnish is oil based for naked wood or paint that is designed to age an item. Our team of professional painters and decorators are always happy to give you an advice on how to choose right type of varnish. We are a local company in North London area dedicated to delivering high customer satisfaction. Our works are carried out primarily in areas such as Muswell Hill, Islington, Highgate, Camden, Hampstead and other parts of North London.